Teppanyaki is a Japanese method of cooking. Teppanyaki translates literally to “grilling on an iron plate.” The name is derived from the words teppan, meaning iron plate or pan in Japanese, and yaki, which indicates grilling or barbecuing. The best part of teppanyaki is that cooking and eating can be done in the same place, making it a fun possibility for a party. 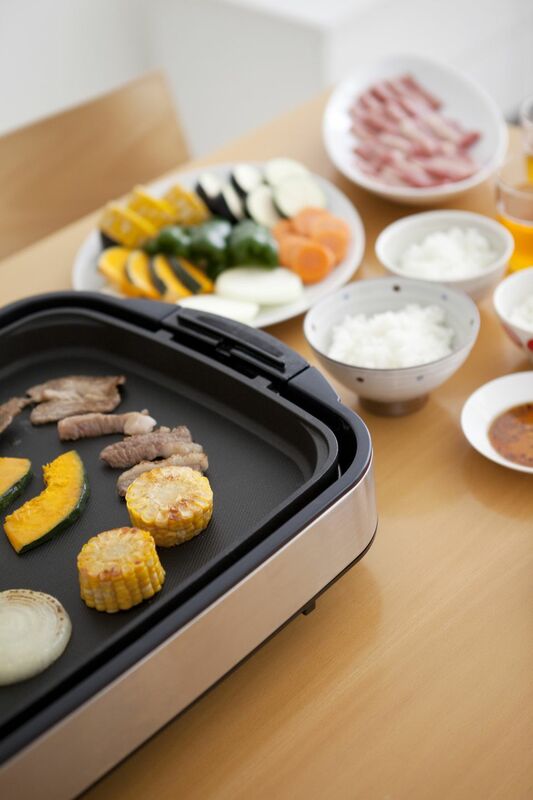 Using an electric pan or a propane-heated flat surface grill are two easy ways to enjoy teppanyaki at home. The latter is often used in restaurants or for people cooking for guests. The teppanyaki grill's solid iron cooking surface is perfect for small and finely chopped ingredients like eggs, vegetables, or rice. Some believe the teppanyaki tradition began over 200 years ago when families would prepare food together on small grills. Others believe it began in the early 1900s with chefs introducing the style, along with their intricate knife skills, to diners. Teppanyaki cooking was first introduced to the United States shortly after World War II, and the concept of the “Japanese Steakhouse” quickly gained popularity. Diners enjoy Teppanyaki cooking not only for the fresh, flavorful Japanese ingredients but also for the performance artistry of the teppanyaki chef who masterfully chops and dices the food, then sets the entire grill aflame in the blink of an eye. Teppanyaki is most often confused with Hibachi barbecue grilling. Hibachi, however, utilizes an open-grate grill with a charcoal or gas flame, whereas teppanyaki uses a flat, solid, griddle-style cooking surface. This makes Teppanyaki suitable for cooking smaller and more finely chopped ingredients, including rice, bean sprouts, onions, carrots, and mushrooms. Any meat or vegetables you use in your teppanyaki should be cut into bite-sized pieces. You can then grill them on the pan or propane grill at the table with your guests seated around it. As the various ingredients are cooked, dip them in the dipping sauce and eat them. In this way, preparing and serving teppanyaki is an ongoing, almost circular process in which you're cooking and eating and cooking some more, all at the same time. Bottled yakiniku sauce, or yakiniku no tare, is available at most Asian grocery stores and works quite well as a dipping sauce when serving teppanyaki. You may also choose to marinate the meat in the sauce before cooking it on the grill. Typical “tare” is made of soy sauce mixed with sake, mirin, sugar, garlic, fruit juice, and sesame seeds. Pre-steamed chukamen noodles for yakisoba and pre-boiled udon noodles are often cooked in teppanyaki. Teppanyaki typically includes cabbage, bean sprouts, shiitake mushrooms, onions, scallops, shrimp, beef loin, pork chops or ribs, sausages, carrots, potatoes, eggplant, corn, green bell peppers, and yakisoba noodles.